Fly Fishing Maryland? Please join us for a Beginners Fly Tying Class on Saturday, November 8, 2008 from 11:00 AM till 2:00 PM. It’s an introductory fly tying class that focuses on Gunpowder river favorite fly patterns. One of our Maryland river guides will be teaching this fun-filled beginners class. Cost of the class is $45 per person, and includes the use of tools and materials. The class is limited to six and pre-registration is required. Please give us a call at 410-357-9557 or drop us a line at info@backwaterangler.com to pre-register. This entry was posted in events on October 29, 2008 by Theaux Le Gardeur. I recently made the drive to the Savage and North Branch of the Potomac for a week of fishing. The North Branch is known for giving up big browns this month, and that coupled with recent stockings brought out more pressure than I have seen all summer. After catching three rainbows in the 17-18 inch range on the North Branch on a crowded weekday, I decided to focus on the Savage for the remainder of the week. I was rewarded with good fishing, saw few anglers and caught some of my nicest Savage River browns of the year. Attractor dries produced smaller browns and brooks, but using a ten foot rod and heavy nymphs had me into nice browns all week. On Wednesday I netted a 16 inch and 18 inch brown on the Savage, and over a dozen fish in the 7-15 inch range. On Thursday morning a cold front brought light rain, heavy clouds and a Savage dam release nearly doubled the flow. I managed in one day to catch double the trout I had in the previous day and all but five browns ranged from 12-15 inches. The higher flow was dislodging a lot of food, because most fish were on the feed, taking a variety of subsurface patterns well into Friday afternoon. The latest video is fish in hand shots, as I was filming solo on a banner day. It wasn’t all play, as I was wearing a pair of Cloudveil’s 8X Grippy Rubber Boots sent to Backwater Angler for testing. The boot will not become available until February 2009. The new Vibram Link Idrogrip compound is the latest alternative to felt in the industry, which is a specifically engineered rubber sole offering grip on wet rocks. Since I’ve worn Cloudveil’s 8X “5.10” soled boot and Patagonia’s “Sticky Rubbers” for over two years now, I had a good gauge and varying water levels on the Savage to test this new rubber’s limits. The Savage has one of slickest bottoms in the state, and the Vibram soles gained traction on the “greasy” bowling balls and uneven bottom with similar results expected from felt. When the river hit 110 CFs on Thursday I could cross the waist deep rapids and scramble over boulders with confidence and a careful step. In comparing the old and new rubber sole designs offered by Cloudveil, I decided both (Vibram & 5.10) were equally “grippy,” although I know my old boot’s rubber soles grip improved after extended use on the river. Consider the Cloudveil shoe is extremely lightweight @ 15 ounces dry VS @ 25 ounces for a felt soled Chota STL+, and doesn’t get heavier when wet, or more importantly track invasives like felt soles. Talk of a ban on felt soles is more than just rumors as Trout Unlimited has urged wading boot manufacturers to stop using felt, and while Patagonia, Cloudveil and Chota now offer rubber soles, and Simms has announced it will no longer produce felt soled boots starting 2010 and Vibram will become the primary sole on all boot models. This entry was posted in fishing report, gear, reviews, video on October 28, 2008 by Jason du Pont. Fly tying in Maryland? Please join us for a Beginners Fly Tying Class on Saturday, November 15, 2008 from 11:00 AM till 2:00 PM. It’s an introductory fly tying class that focuses on Gunpowder river streamer fly patterns. One of our Maryland river guides will be teaching this fun-filled beginners class. Cost of the class is $45 per person, and includes the use of tools and materials. The class is limited to six and pre-registration is required. Please give us a call at 410-357-9557 or drop us a line at info@backwaterangler.com to pre-register. This entry was posted in events on October 26, 2008 by Theaux Le Gardeur. We just received a big shipment of streamers, many of them are classic hair and feather wing patterns. We also have a large variety of Buggers, Zonkers, Muddlers and Sculpins in a staggering number of colors and sizes for the Fall bite. In addition to streamers the shop has stocked up on midge pupas, caddis pupas and nymph patterns, as well as popular attractor nymphs. Be sure to pick up a few “hot” flies on your way to the river and stop in and talk to a Backwater Angler Guide or staff member to get the latest information on fly fishing conditions across Maryland. This entry was posted in gear on October 25, 2008 by Jason du Pont. Was fishing at Big Falls upstream Sat and on my way out in the evening I came across a silver-ish wading belt on the trail. I’ll drop it off at the shop next time I come by. If anyone reports it missing – it has been found. 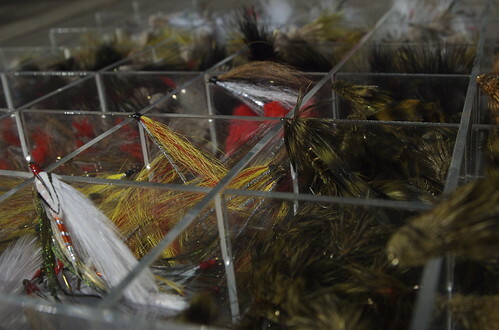 Streamers and caddis seemed to be the ticket Sat afternoon (as predicted). Thanks. Saw a pair of trout rise to my strike indicator at the pre-corner pool – one even took a light sip at it before turning away. Nothing natural comes in a mix of Biostrike chartreuse and pink but they were definitely interested. Another hit on the indicator when I was drowning a pheasant tail with no success. Gotta get a hook in that thing. Maybe gunk up a Mcfoam bug and see if that works. Other than that I fooled several fall fish in my travels. Also had a hit on my line /leader connection in a fast moving chute – not sure what that fish thought it was – but he wanted it. A worm maybe… who knows… Later on, letting the caddis hang in the current while I was talking to Carl , (who was fishing the same area) resulted in no less than 3 strikes. (We talked for a good while…) Nice guy. He’s very pleased with his Sweet-Grass rod, by the way. It is a thing of beauty for sure. Anyway, I’ll swing by and drop off the belt. Tight lines…we’ll be talking soon. Fished the upper section yesterday from 11am to around 4pm. There were bluewings, caddis and tricos coming off and the fish were actively feeding…all the bugs were small…20-26 range…nothing feeding on the top. I didn’t catch anything big but switched to a streamer and picked up 6 nice rainbows (small footballs) all in the 6-8 inch range. The rainbows were all holding in the fast riffles and the extra water was perfect cover for them. The water didn’t turn brown until the end of the day. This entry was posted in fishing report on October 22, 2008 by Theaux Le Gardeur. Please join us for a flyfishing school. On Sunday, November 16, a Backwater Angler Guide will be teaching a fly fishing school that is ideal for beginners. If you’re planning on flyfishing Maryland, or anywhere else for that matter, this course is a great introduction to the sport. The school covers knots, casting, gear and fly selection. Schools are held in a meadow overlooking the Gunpowder river by a Maryland state licensed and insured fishing guide. Class is held from 11:00 AM till 2:00 PM. Cost is $100 per person and includes the use of gear. Class size is limited to 4 and pre-registration is required. Please give us a call at 410-329-6821 or drop us a line at info@backwaterangler.com to pre-register. This entry was posted in events on October 22, 2008 by Theaux Le Gardeur. The trees are turning various shades of oranges, yellows and golds along the river. Many leaves have already dropped, so the leaf-hook up ratio isn’t too bad. The water is low, clear and in the fifty degree range, fluctuating from cold nights and warmer day time temps. Aside from leaves crunching underfoot, the Gunpowder State Park is quiet and a perfect place to wet a line in solitude along seventeen miles of trout water. Fishing the river at these low levels has been productive for anglers using stealth, long thin leaders and small dry flies. Move slowly, wear drab colors, and use polarized glasses to spot and cast to fish in the shallows. 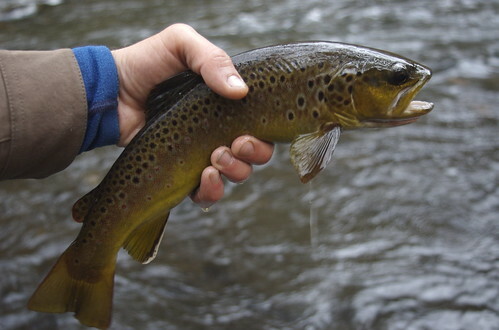 Avoid wading too deep or down river to improve your chances of not spooking the wild browns. Tricos are beginning to be outnumbered by Olives in the mornings, and afternoons on cloudy, rainy days. Reports from customers and guides confirm that the Olives extend through the C & R area, and I have seen the clouds myself at York, Bunkerhill, Masemore and Falls Rd. This hatch is frequently overlooked or mistaken for a midge hatch, as many of these mayflies range in size from 22-26, although the fish have been eating larger patterns. The browns are sporadically rising to the olives early in the flat water, and are quite selective, so consider small caddis patterns or olives around riffles and pocketwater. Midges, caddis and brown stoneflies are also hatching in small numbers, in isolated pockets along the river. This entry was posted in fishing report on October 20, 2008 by Jason du Pont. Please join us for a flyfishing school. On Sunday, November 9, a Backwater Angler Guide will be teaching a fly fishing school that is ideal for beginners. If you’re planning on flyfishing Maryland, or anywhere else for that matter, this course is a great introduction to the sport. The school covers knots, casting, gear and fly selection. Schools are held in a meadow overlooking the Gunpowder river by a Maryland state licensed and insured fishing guide. Class is held from 11:00 AM till 2:00 PM. Cost is $100 per person and includes the use of gear. Class size is limited to 4 and pre-registration is required. Please give us a call at 410-329-6821 or drop us a line at info@backwaterangler.com to pre-register. This entry was posted in events, news on October 17, 2008 by Theaux Le Gardeur. We just received this information from Dennis Genito at Baltimore County DEPRM, (Department of Environmental Protection and Resource Management). So, if you’d like to help out please contact him using the link below and we’ll have an informational meeting at Backwater Angler sometime in the near future. This entry was posted in news on October 15, 2008 by Theaux Le Gardeur. 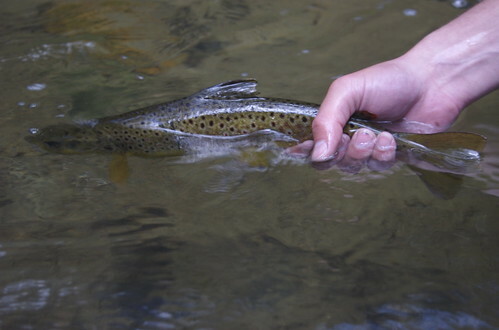 Fall is here and so are ample opportunities to get out and fish for newly stocked trout. If you’d like to, “follow the truck,” we’ve provided information from DNR’s Fisheries page that should prove to be helpful. For more information about where the fish are…check out Maryland DNR’s Fisheries page. This entry was posted in news on October 9, 2008 by Theaux Le Gardeur.